St. Elizabeth’s was begun by a small group of American converts in November of 1997. Fr. 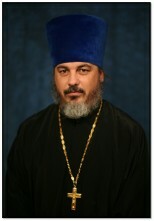 Mark Mancuso, who was raised a Roman Catholic and became Orthodox in 1992, was ordained to be the priest of St. Elizabeth’s in September of 2000. Earlier in 2000, the parish rented a small storefront, which was transformed over time into a beautiful, but small sanctuary in the midst of metropolitan Columbia. It was reminiscent of the storefronts which many of the Russian faithful have attended since the Diaspora began. Like their predecessors, the parish began a building campaign and, on St Nicholas Day in 2010, the fruits of their labors paid off as they served the first liturgy in their own church building. 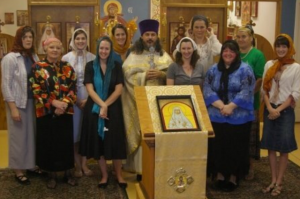 The parish consists of a varied group of not only Catholic and Protestant converts, but also the so-called “cradle-Orthodox” including Russians, Ukrainians, and Serbs. 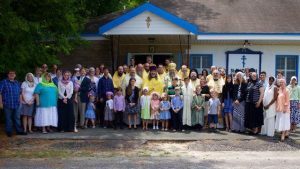 The parish serves a full cycle of services in English and some Slavonic. The parish sisterhood is dedicated to the Myrrh-bearing Women who sought to care for Christ’s body after His crucifixion, but were overjoyed to instead learn of His glorious resurrection. The Sisterhood cares for many things within the parish including the cleaning of the church, the maintenance of the clergy’s vestments, the running of the kitchen in the parish hall, the arrangement of meals for those in need, and the planning of events for the many children of the parish. In addition to their work for the parish, the Sisterhood spends time together socially as sisters in Christ enjoying each other’s company and helping each other to meet their vocation as members of Christ’s church. 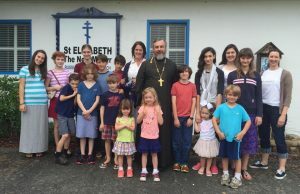 The parish has an active educational ministry with classes in the Orthodox Faith for both youth and adults. There is a Sunday School program for pre-school and grammar school students, a Church School for middle school and high school students on selected Wednesday evenings, as well as a monthly Adult Sunday School program. 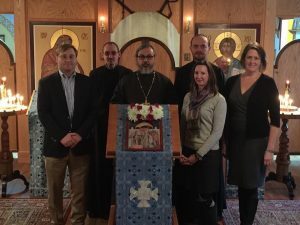 This educational ministry is geared toward equipping the Faithful of all ages to live according to the fullness of Orthodoxy in our rootless society which all too often neglects Christ and His Gospel. In humbly presenting to you the “An Introduction to the Life of the Holy Royal Martyr Grand Duchess Elizabeth”, it’s such a great spiritual honor to speak of such a holy woman of Russia. 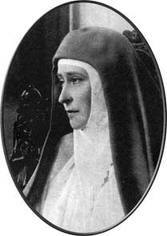 The Russian Orthodox Church Holy Royal Martyr Tsarina Alexandra has many women saints and martyrs such as St. Blessed Mother Xenia of St. Petersburg, St. Alexandra the Royal Martyr (the sister of St. Elizabeth) and St. Barbara (a nun who was martyred with St. Elizabeth the Martyr) only to mention a few. The Grand Duchess Elizabeth Feodorovna (also known as Ella) was born on 20 October 1864, a grand-daughter of Victoria, Queen of England. She was the most august sister of Empress Aleaxandra Feodorovna of Russia. The Grand Duchess Elizabeth Holy Royal Martyr Grand Duchess Elizabeth was married to His Imperial Highness the Grand Duke Sergei Alexandrovich, (see shrine dedicated to Grand Duke Sergei) who was assassinated in Moscow on 4 February 1905. Through her veins flowed the blood of Princess Alice of Hesse, the daughter of Her Majesty Queen Victoria, who was a mother full of love and compassion for the sorrow of others, and who was distinguished by an extraordinary purity of soul and tender heart, which stood out beyond the bounds of the age. As mentioned, the husband of Grand Duchess Elizabeth Feodorova, the Grand Duke Sergei Alexandrovich, was killed by a bomb thrown by evil men within the Moscow Kremlin. After going through a heavy stroke of fate with Christian valor and endurance the Grand Duchess Elizabeth founded a holy convent, became it’s Abbess, she was also an outstanding nurse at the convent hospital and frequently assisted the Red Cross. The name of the holy Convent was Ss. Mary and Martha of Love and Mercy in Moscow, Russia -which still exists today with over 90 nuns. In addition to being a convent and hospital, it was also a place for those who were in the need of food and shelter, caring for the homeless on the streets of Moscow. The Abbess Elizabeth and her nuns were frequently seen late at night distributing clothes and food to those in need. 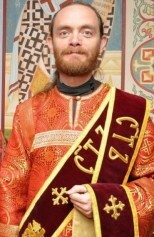 A daily cycle of services were Archpriest Mitrofan Serebryansky, Spiritual Father of Sts. Mary and Martha Convent performed at the holy Convent. The Abbess Elizabeth’s well known spiritual Archpriest Mitrofan Serebryansky, would come and serve the Divine Services often and give sermons of the Gospel of the day and also give spiritual instructions to the nuns. 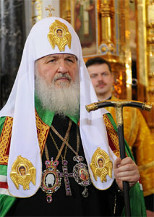 Also His Holiness Patriarch Tikhon of Moscow and All-Russia would often visit the holy Convent and had spiritual respect for the Abbess Elizabeth and the holy Convent. The Royal Martyrs Tsar Nicholas II, and Empress Alexandra, as well as their children would often visit the Abbess Elizabeth at the holy Convent. In humbly speaking about the Holy Royal Martyr Grand Duchess Elizabeth, I am describing a passion-bearer of Christ our Lord. St. Elizabeth the Martyr was a great spiritual woman of love brought to the altar of suffering mankind not only honor and glory, all her fortune, all the hours of her life, but even her life itself; as her reward for all this she received cruel suffering and a holy martyr’s death. The Orthodox Church is already familiar with the deeds of many great women, who, on a par with the great righteous men, exercised themselves in godly works, and shed their innocent blood for God’s righteousness and good deeds. It must be stated that the Orthodox Church believes that at the beginning the only true ‘saint’ or holy one is God Himself. The Holy Scriptures teaches us “For I am the Lord your God; you shall name yourselves holy and keep yourselves holy, because I am holy…” (Levit. 11:44; 19: 2 and 20:7). Man becomes holy and ‘sainted’ by participation in the holiness of God. Holiness or sainthood is a gift (charisma) given by God to man, through the Holy Spirit. Man’s effort to become a participant in the life of divine holiness is indispensible, but sanctification itself is the work of the Holy Trinity, especially through the sanctifying power of Jesus Christ, who was incarnate, suffered crucifixion, and rose from the dead, in order to lead us to the life of holiness, through the communion with the Holy Spirit. In the Second Letter to the Thessalonians St. Paul suggests: “But we are bound to thank God always for you, brothers beloved by the Lord, because from the beginning of time God chose you to find salvation in the Spirit that consecrates you, and in the truth that you believe. It was for this that He called you through the Gospel we brought, so that you might possess for your own splendor of our Lord Jesus Christ” (2:13-14). An explanation of a “Martyr” is a person that sacrifices their life, and fearlessly confesses Jesus Christ as the Son of God and the Savior of the world. Such was the love of the Holy Royal Martyr Grand Duchess Elizabeth, and her faithful cell-attendant St. Barbara, and those who were martyred with them. The most complete web site available in English about the Orthodox Faith with sections dedicated to living the Orthodox Life. 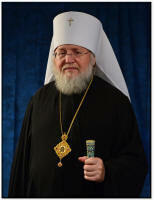 This site, started by the recently reposed ROCOR Bishop Alexander, has numerous Orthodox articles on the sacraments and services of the Church in English, Russian, Spanish, and Portuguese. 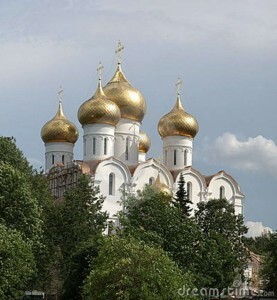 This web site is of the ROCOR cathedral in Washington, DC. It has many articles on the Orthodox Faith and writings of the Church Fathers.